Video + Blogging = Vlogging, get it? 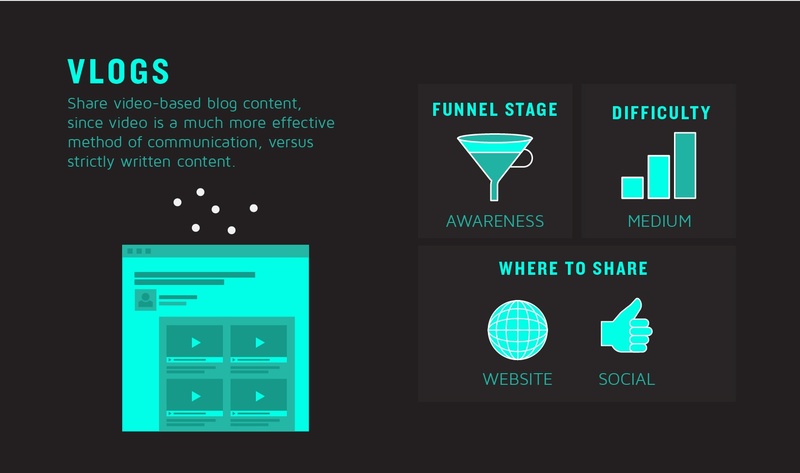 As a marketer, you're likely blogging, and you have videos, both are players in your overall content marketing strategy. So, why not combine two of your tactics to create a much more engaging piece of content? Vlogs are a great awareness stage piece of video content since they promote your business' products and services. Vlogging is a cost-effective way to increase brand awareness, and we've outlined a few reasons why you should start vlogging for your business. The stats don't lie! People love to watch video. 55% of people watch videos online every day (source). Vlogging is a great way to create many videos quickly, due to the level of difficulty in production. Vlogging is pretty easy for you to produce, and it's easy for your viewers to take in the content, too. Vlogging typically has a very simple, one-person production setup. And it is an easy way for your target audience to learn more - they can quickly watch a video instead of reading a block of text. Vlogs allow you to directly speak to the camera - so it's different than seeing photos of people on your website, or reading about your company, it's much more relatable. The more human your company is, the more trustworthy you will appear to your potential customers. By 2019, global consumer internet video traffic will account for 80% of all consumer internet traffic (source). Vlogs are an easy way to refocus a type of content you're already creating, and turn it into video - the preferred content type for audiences now, and in the future. Blogs serve a very particular purpose for SEO - they provide more fresh, written content on your site, which increases your SEO, and the likelihood someone will stumble upon your solution organically. But don't fear, SEO is here and is turning its attention to video! The goal of a search engine is to present the solution for which people are looking. So, since content consumption habits are turning toward video, search engines are responding accordingly by ranking pages with video higher than those without.